Kick off the Holiday Season on December 8th with the Trail of Lights Preview Party! On December 8th, Austin’s favorite holiday tradition turns the lights on, Austin style, with the Trail of Lights Night Lights preview party! Presented by Lyft, the fourth annual event benefits the Trail of Lights Foundation’s STARS at the Trail program, which gives 1,600 children, families, seniors and veterans an exclusive look at more than 1 million dazzling lights before the event opens to the general public. 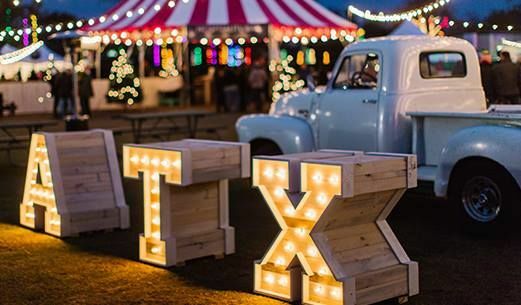 Night Lights not only benefits a great cause, but it’s also a classic Austin great time. The festivities go from 7-10 p.m. at Zilker Park, featuring live entertainment from the Mother Falcon String Trio, Whiskey Shivers, and DJ Mel. Nosh on light bites from Mattie’s, Sway, Moonshine Patio Bar & Grill, La Pera, Chi’Lantro, Texas Honey Ham, H-E-B’s Café Mueller, Cabo Bob’s, Top Notch, Wu Chow, and others. Guests will also enjoy complimentary beer, wine, and holiday cocktails. Night Lights would not be complete without sweets. It is the holidays, after all! Enjoy chocolate treats from Turtle Enoteca and Gelateria, doughnuts from Gordough’s Public House, treats from Skull & Cakebones, and more. There’s also special holiday entertainment, a classic car show, and complimentary rides on both the Zilker Ferris wheel and carousel. There’s also a special Maker’s Market curated by Edible Austin, featuring creations from Sertodo Copper and handmade jewelry from Vinca Inc., plus Texas Coffee Traders, Soul Popped, The Turtle, Lick, and Jaime’s Spanish Village. This year’s Night Lights Preview Party is open from 7-10pm, and individual tickets are $75. Ticket purchase is required for ages 6 and over, and children 5 and under are free with a ticketed Night Lights adult. Please note that parking is not included with individual Night Lights tickets, and that parking is not available for individual sales for this particular event. We do have multi-pack tickets available in 4- and 10-pack increments; you’ll get one pass with the 4-pack and two passes with the 10-pack. Don’t forget the 2017 Food Drive! Help the Trail feed Austin’s hungry by bringing cans of food with you to Zilker Park the night of the event. It’s the season for giving and, with your support, we want to collect more than 25,000 meals for the Central Texas Food Bank. Happy holidays – and we look forward to seeing you on December 8th!